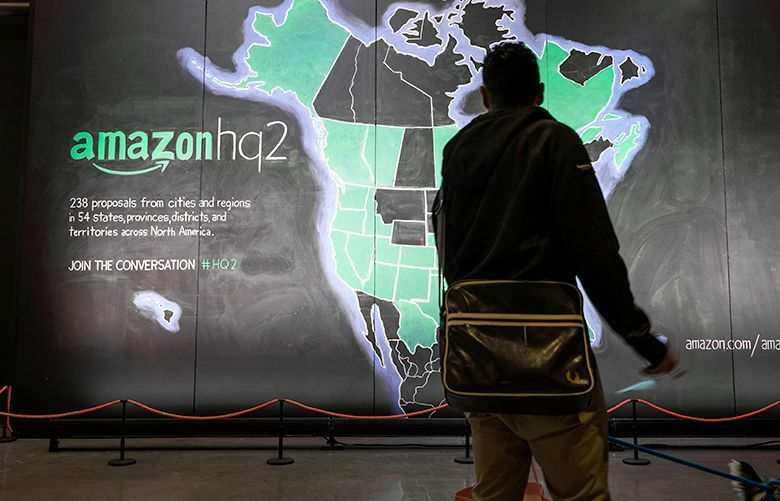 A chalk depiction of the 238 proposals from cities and regions in 54 states, provinces, districts and territories across North America that Amazon received in regards to HQ2 locations. In response to Seattle’s proposed head tax, Amazon is pausing construction of a new tower and may sublease to tenants a new skyscraper in downtown Seattle. Up to 8,000 fewer jobs could be created in Seattle as a result. Amazon is pausing the unprecedented spree of headquarters construction that transformed the city of Seattle over the past decade, suspending plans to add 7,000 to 8,000 jobs in 1 million square feet of new office space. Whether it’s just a political maneuver to influence City Hall’s upcoming vote on a head tax or an actual change in direction remains to be seen. But it could spook developers of housing and offices planning on Amazon’s continued growth. Either way, Amazon is providing a dramatic display of what may happen if city officials continue blaming large companies for the city’s inability to adequately plan for growth or address the homeless crisis, despite huge increases in public spending on the latter. “I can confirm that pending the outcome of the head-tax vote by City Council, Amazon has paused all construction planning on our Block 18 project in downtown Seattle and is evaluating options to sublease all space in our recently leased Rainier Square building,” Amazon Vice President Drew Herdener said in a statement to me Wednesday morning. As startups like Amazon grew into big companies and attracted others, they made Seattle more expensive. They also created jobs and opportunity for hundreds of thousands, directly and indirectly, as they made the region more prosperous. Tax revenue they generate, including from office construction, has enabled City Hall to increase spending on all sorts of programs in recent years but apparently it’s never enough. Amazon informed architects and developers Tuesday that pending the outcome of a City Council vote on a new head tax, it is pausing construction of a 17-story tower and may sublease rather than occupy a skyscraper under construction at Rainier Square. This decision comes shortly after Amazon said it would add 3,000 new jobs at its Vancouver, B.C., office and 1,000 more in Boston. The company will also soon disclose the location of its second headquarters elsewhere in North America. That’s partly intended to give Amazon options to expand in a more receptive community than Seattle, where it’s losing patience with City Hall’s increasing hostility toward large employers. “I’m deeply concerned about the impact this decision will have on a large range of jobs — from our building trades, to restaurant workers, to nurses, manufacturing jobs and tech workers,” she said. Much of the Seattle business community strongly opposes the City Council’s proposal to impose a per-employee tax of $500 per year. That would convert to a payroll tax in 2021 and generate around $75 million per year. The revenue is earmarked for homeless services and affordable housing, even though the city has roughly doubled its funding for such programs since 2013, to $63 million a year. It spent $1 billion over the past 20 years but continues to struggle with improving the performance and outcomes of its homeless response. Across King County, about $200 million a year is now spent on the crisis. Seattle’s head-tax was proposed as a way to make its taxation more progressive, although business now pays about 60 percent of the total and there are no proposals to reduce any of the city’s regressive taxes. Council members could finalize the tax as soon as May 14. A recent hearing on the topic was rowdy, dominated by social-service providers, activists and others demanding the city “tax the rich” and spend even more on social services. Amazon is opposing the tax behind the scenes and began calling developers and architects Tuesday. “Our firm was notified late in the day yesterday to pause the project pending the resolution of the head-tax issue that the City Council is currently deliberating, so we are suspending our work immediately on the project based on that direction,” said architect Peter Krech at Graphite Design Group, which designed the 17-story Block 18 tower. Whether Amazon is truly halting the projects or just playing political hardball remains to be seen. “My read is they’re serious,” said Bob McCleskey, chief executive of Sellen Construction in Seattle, which was expecting to start work on Block 18 this summer, employing 350 to 400. McCleskey said Amazon pausing its growth in Seattle will have “a big ripple effect that’s hard to predict,” affecting construction of new housing and other office buildings. At Rainier Square, construction will continue on a skyscraper that will be Seattle’s second-tallest building, despite Amazon wavering on whether to occupy the 722,000 square feet of space it leased. “What they told us was that they’re going to start evaluating options to sublease the space,” said Greg Johnson, president of developer Wright Runstad & Company. Johnson said the 4,500 employees who were to occupy the offices may go elsewhere. That’s the biggest concern. Seattle’s treatment of its most successful homegrown companies is telling businesses of all sizes whether it remains a good place to create jobs and build their future.